The electric sector in Hawaii is currently undergoing an extensive planning effort to determine the best path forward to achieve the State’s renewable energy goal of a 100% renewable portfolio standard (RPS). This comprehensive planning effort is being facilitated by the PUC, which directed HECO to file a Power Supply Improvement Plan (PSIP) to present a clear and transparent “optimized” roadmap towards a 100% renewable future. On the pathway to achieving this, a number of technical, policy, economic, behavioral, and environmental issues will need to be identified and addressed. Below are two charts that serve as figurative examples of an issue that may come into play as the state reaches higher levels of renewable energy penetration. There is a complex interplay between total load, total must take renewable energy, utility controlled renewable energy, power plant characteristics such as minimum levels of generation, and operating reserve requirements that define the demands on thermal generation. In the first case of moderate solar energy, the thermal generators need to ramp down and up, adjusting to mid-day solar generation and the evening peak load. 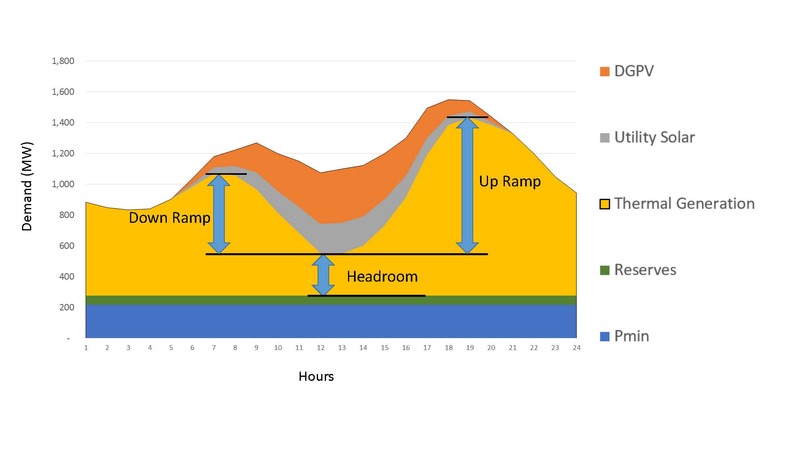 In the second example, solar is so abundant in the middle of the day that the ramping requirements become much steeper and the demand on thermal generators falls below the plants’ minimum generation and reserve requirement levels. 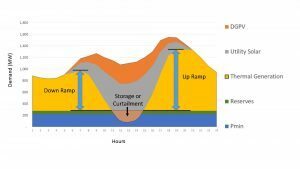 At this point, a strategy such as energy storage, curtailment, or lowering the minimum generation requirements of generators must be pursued.